Captain Mike Bertelsen is the department's administrative division captain. Captain Bertelsen grew up in the San Gabriel Valley and has worked his way through the ranks of the Azusa Police Department. He began his career when he was hired by the department as a jailer in March of 1994. As a jailer, Captain Bertelsen was responsible for the intake and processing of arrestees, as well as the monitoring of prisoners being housed in the city jail while preparing them to go to court and other custodial facilities. After a year in his assignment, Captain Bertelsen applied for the position of police officer trainee. He successfully completed the testing process and attended the Rio Hondo Police Academy in Whittier. Upon graduation, Captain Bertelsen was assigned to the patrol division in August of 1995. In addition to working as a jailer and patrol officer, Captain Bertelsen has worked a collection of special assignments, including field training officer, property crimes detective, gang crimes detective, patrol sergeant, patrol lieutenant, detective lieutenant, and operations division captain. Captain Bertelsen also worked a variety of collateral duty assignments, such as explorer advisor, citizen's academy instructor, community service officer/police aide supervisor, social media team supervisor, Azusa Golden Days liaison, field training officer manager, reserve police officer coordinator, and terrorism liaison officer. While working as a gang detective, Captain Bertelsen created a gang specialist unit to provide greater gang intervention, prevention, and enforcement in the community. The program was very successful, eventually evolving into the department’s current crime suppression team. It is a core component in keeping residents, business owners and visitors safe in the community. In 2004, Captain Bertelsen was awarded the Riverside County Sheriff's Department's Medal of Courage. While off duty, Captain Bertelsen assisted deputies in apprehending a combative suspect that was armed with a handgun. Thanks to his assistance, the suspect was safely arrested. 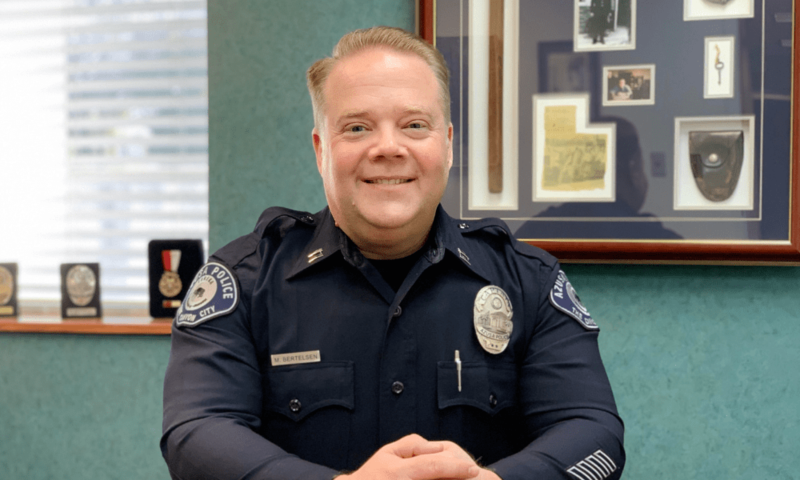 Captain Bertelsen holds an Associate Degree in Administration of Justice from Mount San Antonio College, a Bachelor’s Degree in Public Administration from Cal Poly Pomona, and a Master’s Degree in Organizational Management from Azusa Pacific University. He believes in being a lifelong learner and regularly attends training to continue his professional growth. Captain Bertelsen is also a strong supporter of community outreach efforts by law enforcement. He believes it is absolutely necessary for the Azusa Police Department to have strong partnerships with the community. It is through these partnerships, communication and community engagement that the Azusa Police Department will continue to successfully support the city of Azusa.